Welcome to the online home of Dread Utopia. Peruse at your leisure and sign up for our mailing list to receive the latest news and special offers from Dread Utopia. 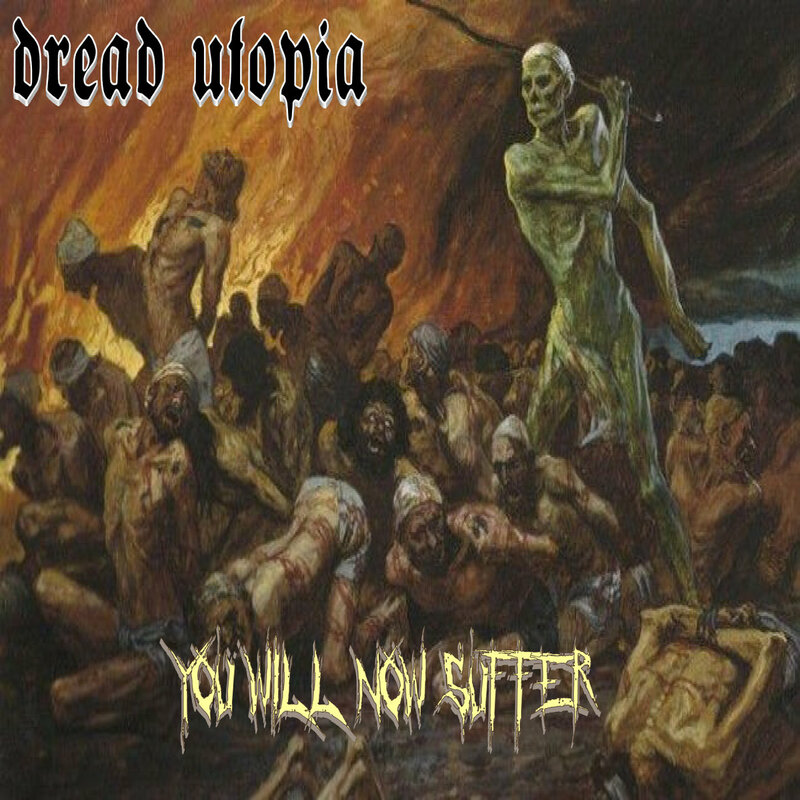 Dread Utopia Releases New Single "You Will Now Suffer"
January 18, 2019 - Dread Utopia announces release of new single titled, "You Will Now Suffer". The new single is far different from their previously releases. "You Will Now Suffer" is a new direction for Dread Utopia, one we embrace wholeheartedly", says guitarist Harry Glaspell. "We have a whole batch of new songs that are just as fast, brutal, and heavy as "You Will Now Suffer", said Harry. The band says they will continue to record more music in the coming months and hope to have a new EP released in the Spring. Says Harry, "We haven't held ourselves to a timetable. We don't want to rush anything, but Spring is the target release date for a new EP." You can listen to the new single on the band's Bandcamp page and on streaming platforms YouTube and Soundcloud. July 22, 2018 (CHARLESTON, WV) – Charleston, WV metallers Dread Utopia are proud to announce the release of their debut instrumental demo titled ‘Dread Utopia’. Says founding member Harry Glaspell, “This demo is a long time coming. The band has been in existence for three years with a few lineup changes, so I am just happy that we can finally release our music to the world and everyone can hear what we are about”. Call it Stoner Rock, Doom Metal, Prog Metal, or Death Metal; ‘Dread Utopia’ cannot be pigeon holed to a single genre of metal music. “The music on this demo is a direct representation of who we are and how our musical influences have shaped our music. Our goal is simple: create heavy music that we love to play”, said Harry. ‘Dread Utopia’ was recorded live at The Bakery in Charleston, WV and tracked by Jason ‘Roadblock’ Robinson. ‘Eyes That Hypnotize’ and ‘Test of Wills’ were mixed and mastered by Jamie Skeen. ‘Starlord’, ‘Chasing Dreams’, & ‘Doomus’ were mixed and mastered by lead guitarist Tim Stuart. About the band: Born out of the infamous Chemical Valley of West "By God" Virginia, Dread Utopia was formed in 2015. Dread Utopia is just four dudes who love to play heavy music and try not to take themselves too seriously. Is there any better name for a doom metal band than Dread Utopia? Probably not. As impressive as their wit is when it comes to word play, their latest demo Test of Wills is infinitely more captivating. In fact, it wouldn’t be too much of a stretch to say that Test of Wills was captivatingly filthy. The instrumental track didn’t need vocals, the instrumentals carried so much momentum and energy alone, there was little room for lyrical offering. As much as I adore the atypical, sludgy Heavy Metal vocals the guitar-driven riffs spoke volumes as they fluidly went about their thrashing chord progressions around the concordantly rhythmic drum rols. I have no doubt that Dread Utopia can become the Doom Metal band to shape the current scene considering the band are formed by a raucously elemental collective of Virginia, US based instrumental deities. Head on over to BandCamp where you can stream and download Dread Utopia’s instrumental demo Test of Wills now. Give them a like on Facebook to keep up to date with all of their latest releases and tour dates.